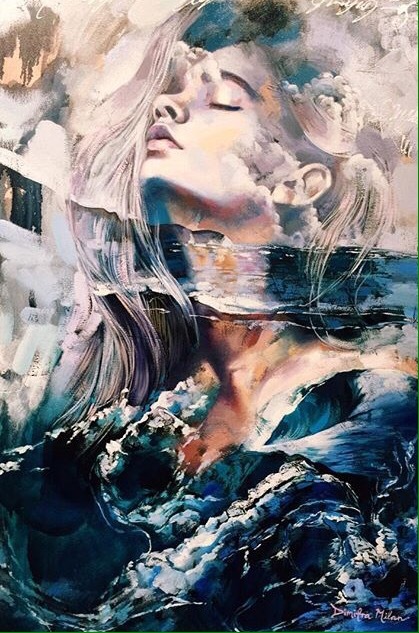 Dimitra Milan is an young artist from Arizona, USA. She lives at the Milan Art Institute, which is the art school from her parents John and Elli. She has been painting for a long time and did classes at the institute. On instagram she shares her works and an inside to her life, which gives the opportunity to understand and like her artworks even more. 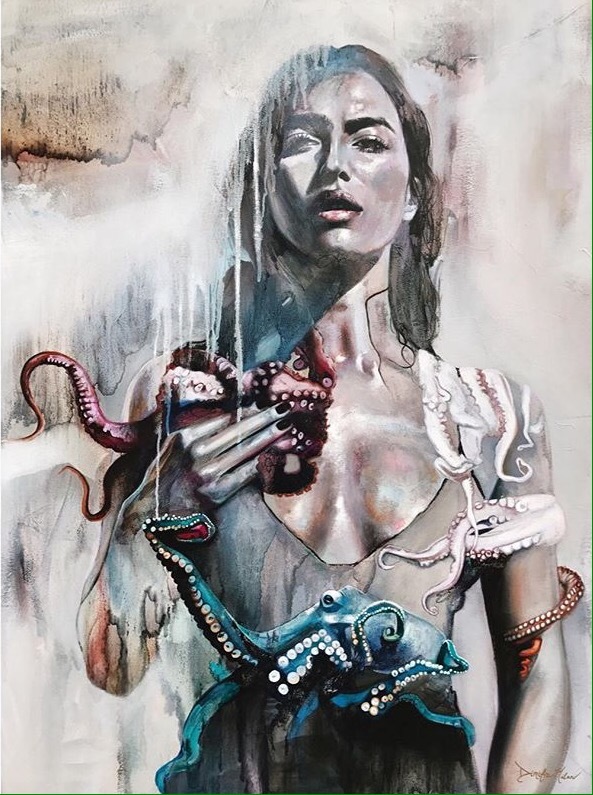 Her works are dreamy and abstract portraits with very realistic parts, she uses different techniques. She was on national television and her work is in galleries. At the age of 17, she is already hiring people for her business and is very mature. So while I was trying to graduate (I succeed!) I also knew I had to plan a trip to Greece since Dimitra would be there with her family who have Greek roots. It would be way more easy and cheaper for me to meet her there instead of in Arizona, since I live in the Netherlands. The only thing was: she would leave Athens when I would arrive. So her mom suggested to meet in Naphlio. Elli: thank you for that idea, I loved the place! 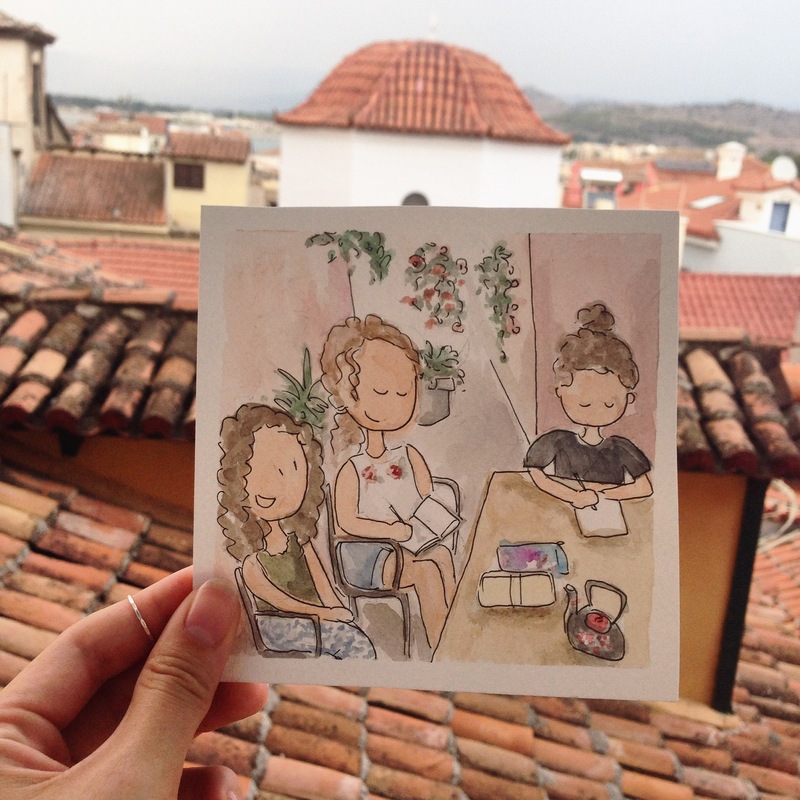 I will introduce you all to the Milan family and the friend Miranda, but this blog post is all about the girl who made me plan a second Traveling Sketchbook trip (the first one was to London). So in another post you’ll read about them! 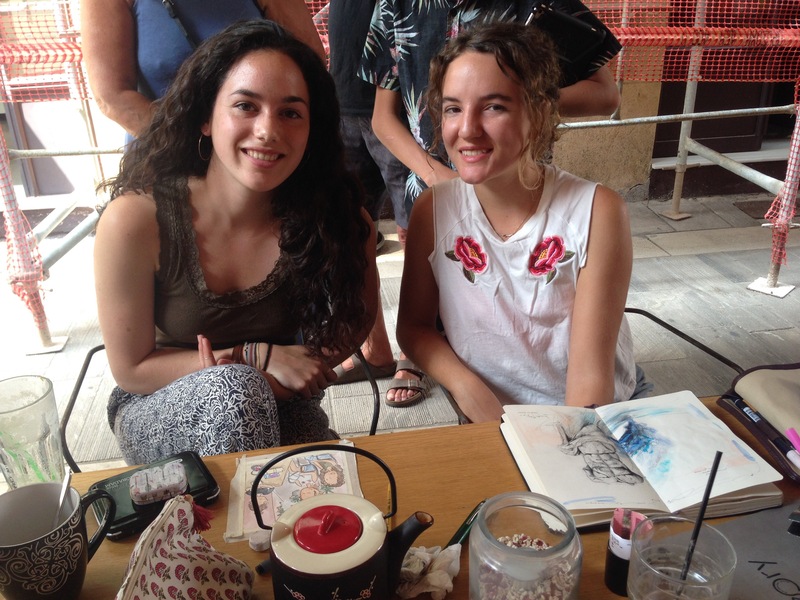 We (Dimitra, Dafni, Dalia, Dino, Miranda and me) went to a cafe to have some drinks and create art. The girls had their own sketchbook, Dino an Ipad and Dimitra got the Traveling Sketchbook to work her magic on. While she was creating a torso from a Greek sculpture we talked about a lot. I told everyone that I find Dimitra fragile, like: small and sweet. Her brother made sure I knew she can be determined and strong too. “If she wants to go to bed while we are all chatting, she just leaves. She does her thing: what she likes.” And soon I found out this little girl is very mature and quite an impressive person with a beautiful personality. Another thing what Dimitra believes is that galleries and publishers are going to be less important because of Instagram and other platforms on the internet. Artists get more publicity and fame but also more profit, since they don’t have to pay to the galleries and other stakeholders. At a point, Dimitra for example just got like 10% of the works she made. Now she will be more independent and getting more profit. “For a 17-year-old you make a lot of money, how do you handle that?”, I was wondering. Dimitra’s answer was again very mature and so understandable. She said that having a business asks for a lot of investments too. She also prefers to offer good quality to her customers so she has to figure out when to find good quality prints for example. Since she prefers to spend her time painting instead of figuring those things out, she hired someone to do research like that: and that costs money. I have the feeling Dimitra really knows what she is doing (even-though sometimes it might not feel that way for her) and I admire her for that! And very important to say, she really doesn’t paint for the money but because she loves it and because it is her way to express herself and to contribute to this world, which is beautiful. This is also the reason why Dimitra prefers her painting she creates out of her feelings over commissions. In the commissions she gets restrictions which can limit her artistic freedom. With the whole family we went to the beach where we swam. There we found out Dimitra and I swim in the same way! The waterpolo way haha. So funny. We chilled around and went on those bike-boats with a slide on it. We took photos underwater where our eyes filled up with salty water and while I sat with her father, Dimitra fell asleep at the beach. In the night we went for a Greek diner from the family of the family friend Barbara (who happens to be very friendly). I really liked the whole day. Dimitra told me some people might think she is so special and having another life, as an insta-famous person. But she finds herself very normal. To me she is to, she actually felt already like a good friend. Just like the other family members and family friends by the way. Everyone was so chill and sober, not arrogant or anything like that! The morning after they went towards the new town of their trip and I went back to Athens. We had to say goodbye and there were hugs and sweet words. Walking back to my hotel I realized, a bit emotional: this family is very special and I can’t wait to see them again. Please check out Dimitra’s Instagram or website and see what I have been so excited about for the last couple years. 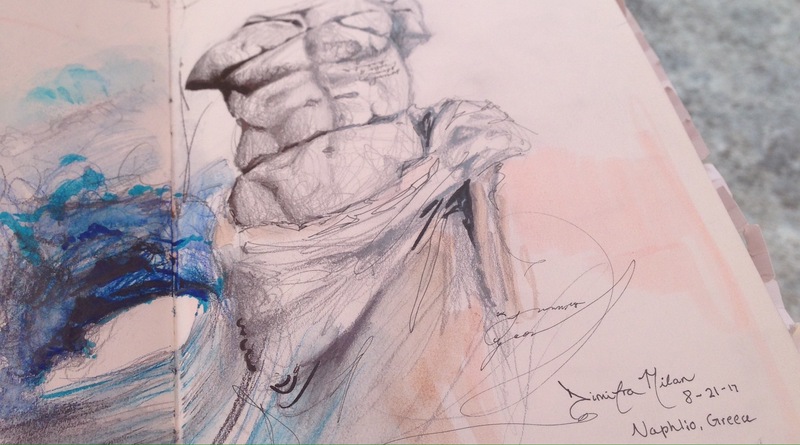 Dimitra’s work, just like the other works in the Traveling Sketchbook, will not be shown completely. But here you can see a part. You will be able to see the full creation during the Traveling Sketchbook exhibition. But that will take place after I had some more travels in the search for more of these inspiring stories.